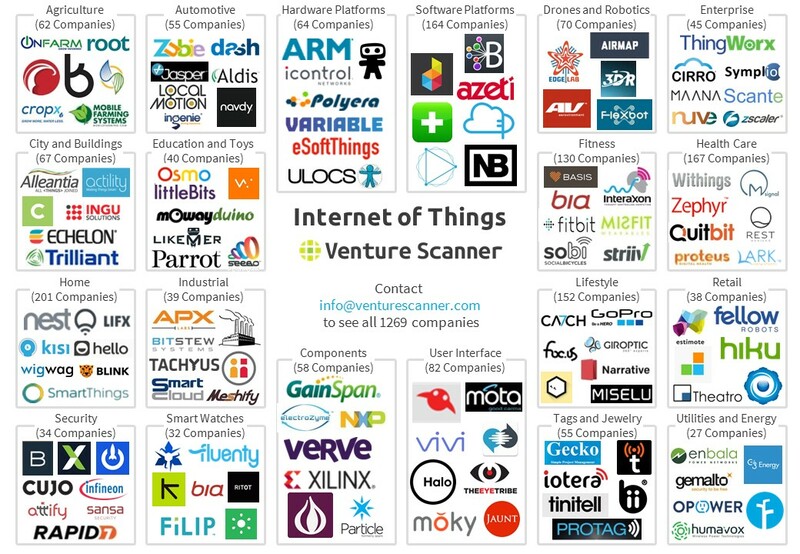 We at Venture Scanner are tracking 1269 Internet of Things (IoT) companies across 20 categories, with a combined funding amount of $19.2 Billion. The 15 visuals below summarize the current state of Internet of Things. 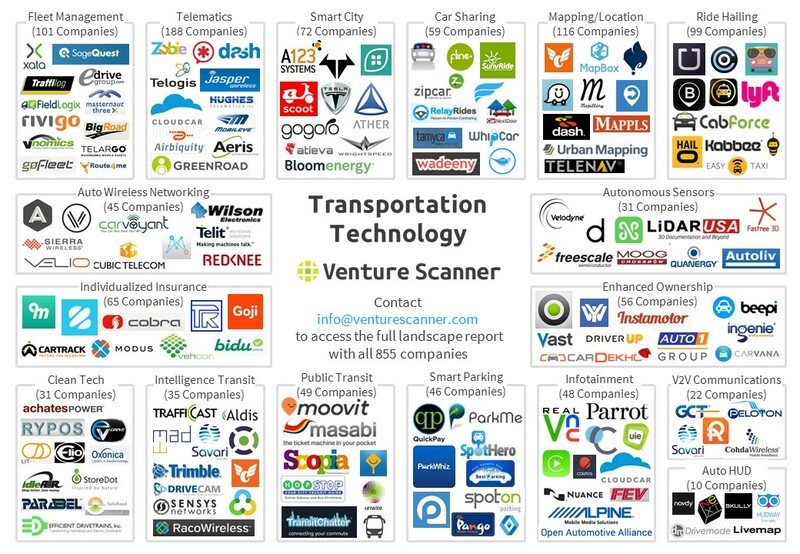 We at Venture Scanner are tracking 855 Transportation Technology companies across 17 categories, with a combined funding amount of $43 Billion. The 15 visuals below summarize the current state of Transportation Technology. Auto Clean Tech: Companies that create next-generation solutions seeking to make transportation friendly towards the environment. Examples include technologies to increase fuel efficiency, lower emissions, and take advantage of renewable fuels. 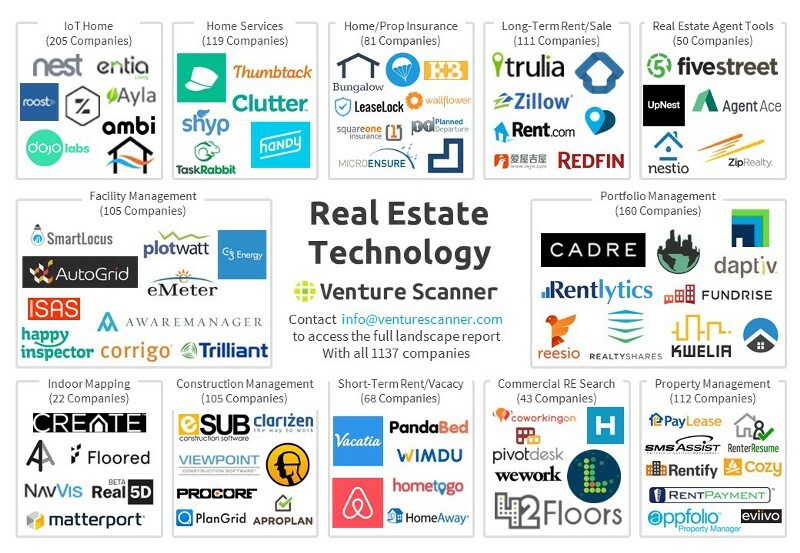 We at Venture Scanner are tracking 1,137 Real Estate Technology companies across 12 categories, with a combined funding amount of $16.99 Billion. The 15 visuals below summarize the current state of Real Estate Technology. Property Management: Technologies that help in the day-to-day operation of real estate rentals. Examples include tenant management, electronic payments of rent, and tools for landlords and tenants to communicate. 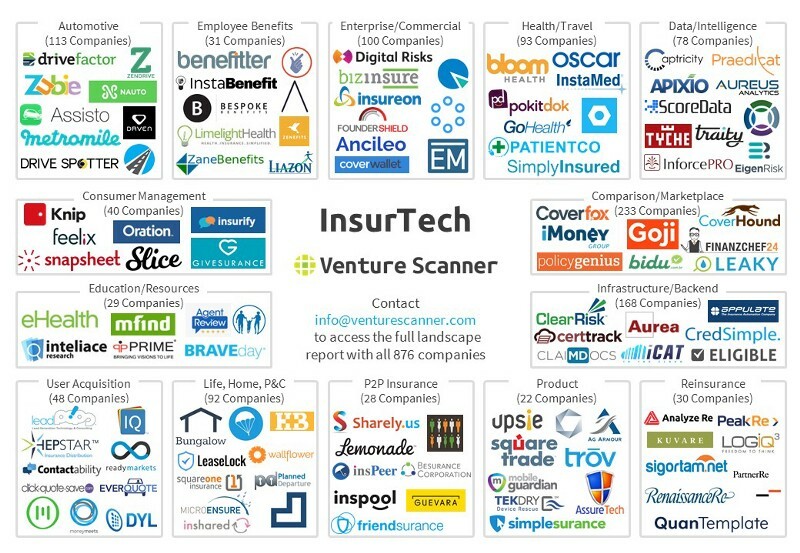 We at Venture Scanner are tracking 876 Insurance Technology companies across 14 categories, with a combined funding amount of $15.6 Billion. The 15 visuals below summarize the current state of Insurance Technology. 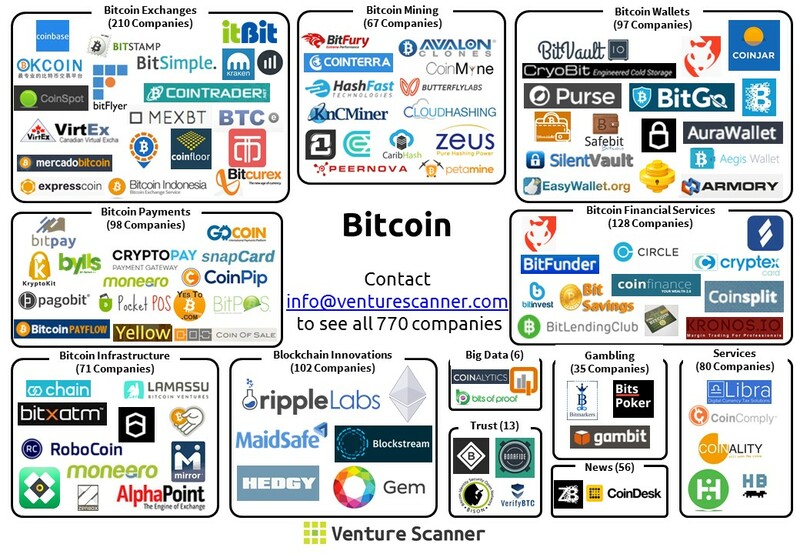 We at Venture Scanner are tracking 815 Bitcoin companies across 11 categories, with a combined funding amount of $1.3 Billion. The 15 visuals below summarize the current state of Bitcoin. We at Venture Scanner are tracking 1,091 Health Technology companies across 22 categories, with a combined funding amount of $20.3 Billion. 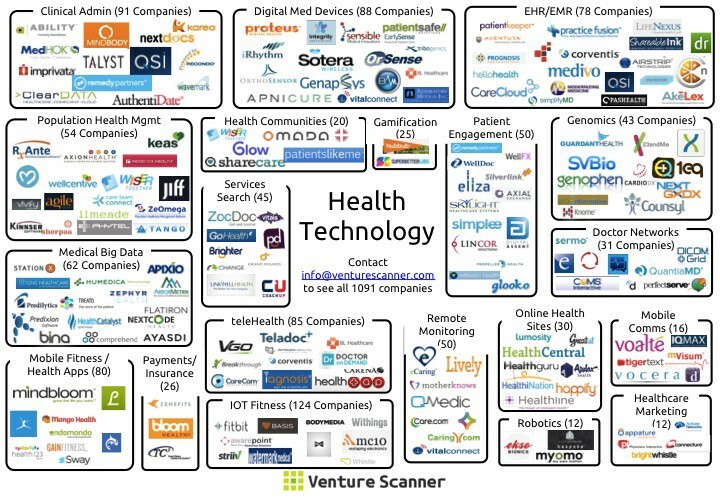 The 15 visuals below summarize the current state of Health Technology. 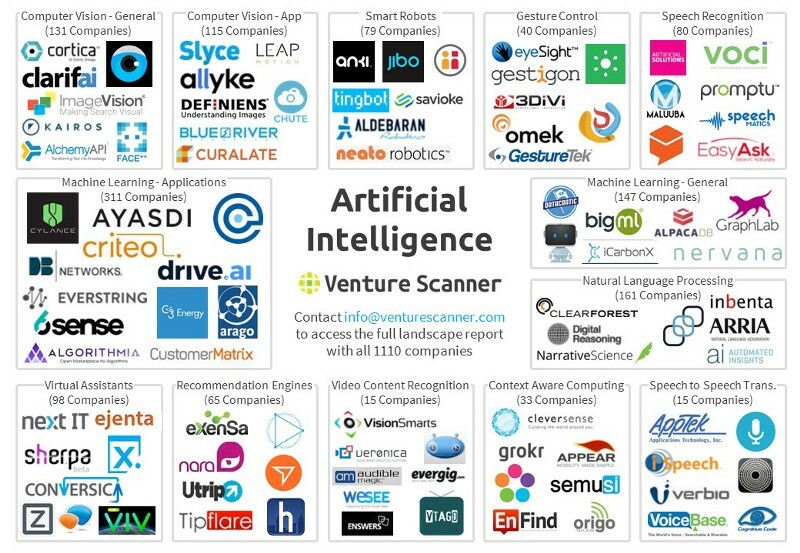 We at Venture Scanner are tracking 1104 Artificial Intelligence companies across 13 categories, with a combined funding amount of $6.27 Billion. The 15 visuals below summarize the current state of Artificial Intelligence. Deep Learning/Machine Learning (General): Companies that build computer algorithms that operate based on their learnings from existing data. Examples include predictive data models and software platforms that analyze behavioral data. You asked, and we’ve delivered. We are excited to announce our latest feature enabling you to create your own startup landscapes. If you are a subscriber to any of our sectors, in addition to having access to Venture Scanner categorized landscapes, you can now create your own landscape categories. This will enable you to take our startup landscapes as a reference point and create your own category structures that best fit the needs of your unique strategies and direction. In your Venture Scanner room, click on the green Add Category button in the My Categories section and then name your category. 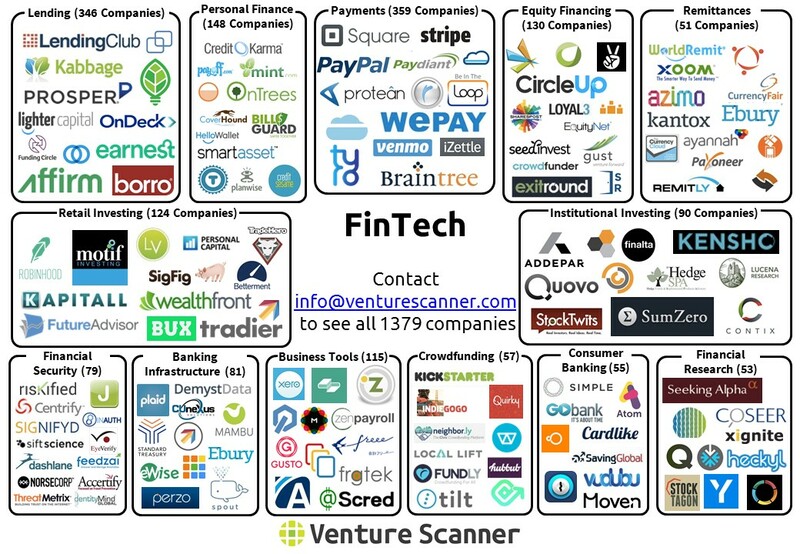 We at Venture Scanner are tracking 1,639 FinTech companies across 16 categories, with a combined funding amount of $45 Billion. The 15 visuals below summarize the current state of Financial Technology. Personal Finance: New ways for consumers to manage their personal finances. Examples include tools for tracking expenses, managing a budget, addressing wrongful credit card charges, and optimizing credit card rewards.